A.T.H. Webber: Israel Vs. Palestine - the battle for Facebook. 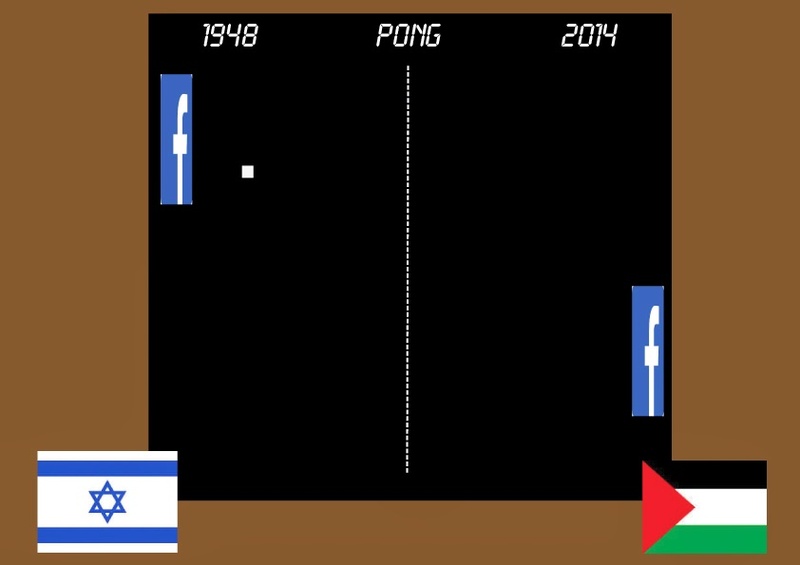 Israel Vs. Palestine - the battle for Facebook. In relocating to the Middle East from the Melbourne suburb of St. Kilda, I managed to move from Australia's Jewish heartland to a country that is entirely Muslim. As a result, I have people on my friends list that are entirely Jewish, or entirely Muslim. I won't name them. Because it isn't important, but it is interesting that, from time to time, both groups have commented or liked something that I have posted. Not surprisingly, they managed to do that and not start lobbing hand-grenades at each other. But who would get uppity about a cat video? What is happening only a few hours flight away from where I type this is abhorrent. Israeli folk having to hide from rocket attacks. Palestinians getting pummeled by retaliatory force. Both sides, angry and fearful. But they are there, and I am here, grateful that I am not actually anywhere near anything explodey. There isn't any getting away from it though, my news feed is getting its own pummeling - from all sides. It seems that all sides are lobbing hateful, vile and agressive videos, or artfully spun propaganda at my feed. No one seems to want to add an opinion, though. 99% of the stuff on my feed is presented without comment. Just another 3 minute explosion fest with someone's mother wailing horribly, or another young man screaming incoherently at the camera - translation is not required, no matter what side they come from I can guess what the intent is. What good does it do? What are they trying to tell me by posting those feeds? How am I supposed to interpret what they want if they don't say anything? I have made this suggestion before, and the response? "I can't say anything..." and then some kind of assertion that it is due to a fear that "they" will respond, probably with violence. Or "You don't understand" is another perennial favourite. I have spoken to people on all sides, personally.. here is what I understand. "I fought in the six day war, one of the best things I have ever done in my life was afterward. I drove a bulldozer, and was one of the people charged with levelling [palestinian] houses." This from a man I respect, who is able to create a compelling argument as to why his side is right, and the other side are animals. And yet, if I drive into the industrial area here in Abu Dhabi, I see his face everywhere - but there are no yarmulkes to be seen, only gutras (head scarves). "We just need to keep on bombing them for another 5.. maybe 6 days. then we will have peace." (Circa 2006/7) From one of the nicest people I have ever met, who says that he loves living in Australia because it is safe. "My daughter can marry anyone" he said once, then after a pause, "Unless he is a muslim." "I won't have to do anything, she won't marry one." "These people call the occupied territories a country? They have no country, they should go back to where they came from, or be forced into the sea." From someone that I respect, who is able to create a compelling argument as to why her side is right, and the other side are simply occupying fascists. "The SS didn't work fast enough" - common response. There are more, but I think this illustrates a point well enough. I will add that ALL of the people indicated in the above examples are extraordinary. Generous, kind, animal lovers, charity givers - people I could rely on to help me move a fridge to a new home if you get my point. What they all have in common is a figurative bomb on their mantle piece, whose pin they would happily, no, DUTIFULLY pull, should the need arise. Silence - it is insidious. It allows the post to be placed without frame, a brutal picture with no explanation. I'm done with "They started it." I'm done with all the hate. People need to do something. SAY something. Actively start looking for a peaceful solution, or at least have the courage to state their conviction if they feel otherwise. This skulking behind posts is cowardly. Me? I want people to stop killing each other, that's all. I am part of a fast growing group of people who actually don't care about who is right or wrong - a growing number who are disgusted by all sides. That's my position, it might be unpopular, but at least I had the courage to express it. buy Facebook comments USA to get in touch with the world and get famous by the promotion. With such a large number of various choices on Facebook it's occasionally hard to figure out what is the best alternative to run with or at times even where to begin. Erasure, now on Kindle Prime - so go borrow it!